What are Pulse Oximeters & their uses? Pulse Oximetry is a non-invasive technique to measure the oxygen saturation in a person’s blood. Put simply, it tells you whether your heart is pumping enough oxygen to all parts of your body. A pulse oximeter is designed to be clasped to a peripheral organ like the earlobe, toe or finger, but is most commonly used on the fingers. A pulse oximeter transmits tiny light beams through the skin and measures how much light is absorbed by the blood flowing in the peripheral vessels. The amount of absorption signifies the level of oxygenation in the blood. It is therefore, also able to calculate the heart rate. 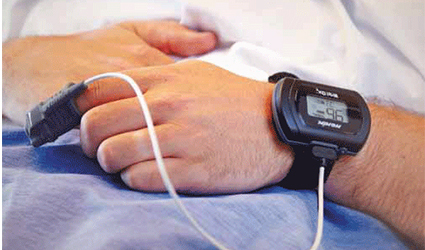 Pulse oximeters are handy in an ICU setting and also in a pulmonologist's clinic to assess a patient’s SpO2 in diseases that impede blood oxygen levels. These include asthma, COPDs, lung cancer, pneumonia, anemia, heart failure, etc. Drugdu.com not only offers the best-in-class pulse oximeters but also presents different pulse oximeters catering to pediatric age groups as well as adults. We provide an array of compact fingertip oximeters including models that come with wired handheld monitors powered with LED displays.